I made these costumes for my children when my 3 year old asked to be a pumpkin for Halloween. 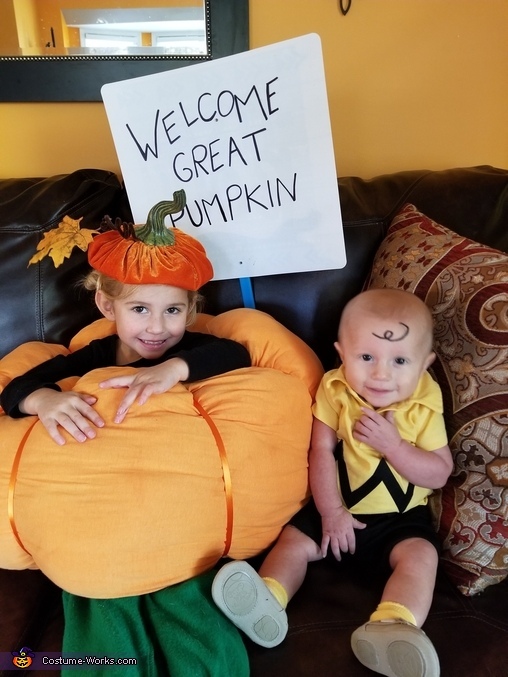 Her little brother who is 4 months old looks just like Charlie Brown so I thought it would be cute to make them a pair. I made her pumpkin using pillowcases dyed orange. I used safety pins to attach the pillowcases together to make it round and stuffed them with stuffing. I used orange ribbon tied around the pillowcase to make the creases of the pumpkin. And the stem was taken off a decorative pumpkin I had that I glued a leaf and a hairpin to so she could attach it to her hair. She wore green sweatpants as the stem. I hand wrote the sign to match the writing of the sign in the actual movie. For his costume, I dyed a white polo shirt yellow, used felt to make the zig zags on his shirt, black shorts and white socks also dyed yellow. He let me draw cartoon hair on his forehead and was all smiles. They both had a great time with it. We even have a Beagle who is in one of the pictures posing as "Snoopy".